N of Green Gables, I知 Like This. How About You? 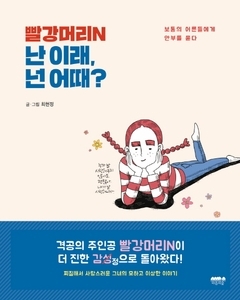 Home > Books in Korean > Non-Fiction > Non-Fiction II > Titles Starting With I ~ Z > N of Green Gables, I知 Like This. How About You? Choi Hyun Jung, who gave birth to 鮮 of Green Gables� as the ambassador of workers, young adults, and middle-aged adults, has released a 2nd book. One webtoon is uploaded every day on Instagram, and it is well loved every day. What痴 its secret to success? The surprise jokes of a currently employed copy writer? The witty rebirth of N as a Korean youth? Every answer is correct. However, if only one answer is to be chosen, isn稚 it because the value of everyday life is brought under the spotlight through N? It痴 hard not to sympathize with N as she lives her everyday, plain life, eats by herself, and talks about the real dangers of society.